BG03 Blowdown Vessels – Warning, some Vents must be Bigger! The New guidance Note BG03 Means some Existing Installations AND Blowdown vessel ranges WILL NOT COMPLY. Some Vent SIZES MUST be BIGGER than before. Advice was previously provided by Health and Safety Executive Guidance Note PM60 Steam boiler blowdown systems 2nd edition 1998 which has been withdrawn. 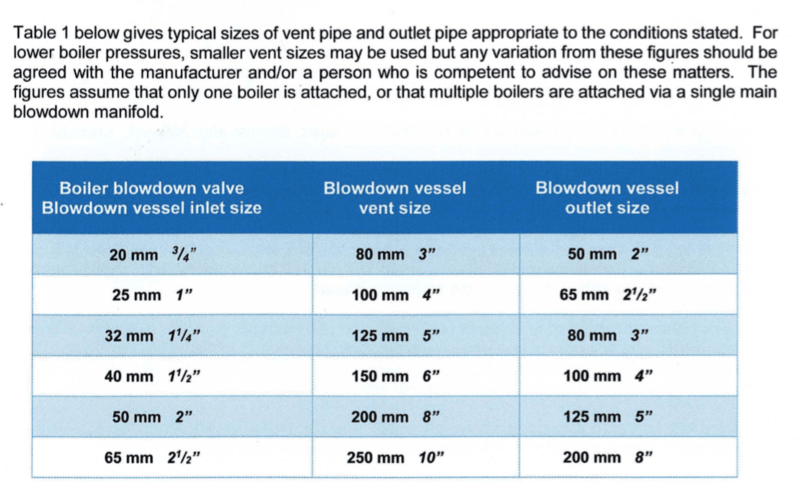 Owners/Users of plant (per PSSR regs) wanting existing installations to comply with current guidelines can check their vent size in order to comply with the chart shown further on in this document. BG03 states: “Any variation from these figures should be agreed with the manufacturer and/or a person who is competent to advise on these matters” – Now that’s going to need some real science applying as all installations are different. DOES comply straight out of the box – Many competing products on the market CLAIM to comply, but simply don’t. Please do check with us before ordering a blowdown vessel and we will check compatibility with BG03. For those of you who enjoy a little light reading please see information below. We have summarised the key points for you. • Proper maintenance and inspection of Blowdown Vessels and pits including requirements for regular inspection by a Competent Person in accordance with the Written Scheme of Examination (WSE). Advice was previously provided by Health and Safety Executive Guidance Note PM6O Steam boiler blowdown systems 2nd edition 1998 which has been withdrawn. The BG03 guidance applies to blowdown arrangements for steam boilers with a maximum evaporative capacity not exceeding 30 tonnes of steam per hour and working pressures not exceeding 32 bar gauge including water tube boilers with a single main blowdown line. • Design and construction information for blowdown pits. Experience has shown that the state of repair and rate of deterioration are difficult to monitor, and serious undetected leaks have been known to undermine foundations. It is recommended that no new blowdown pits be constructed and a blowdown vessel shall be the preferred option. Blowdown is essential to control boiler water contamination. As a boiler generates steam, any impurities that are in the boiler feedwater which do not boil off with the steam will concentrate in the boiler water. As these dissolved and suspended solids become more concentrated, steam bubbles fail to burst as they reach the water surface. They accumulate as a layer of foam in the void above the boiler water and ultimately get carried over into the steam system. Not only does this make the steam leaving the boiler excessively wet, but it contains contaminants that could clog and damage control valves, heat exchangers and other equipment. Suspended solids form into sludge that can coat boiler heating surfaces and control devices causing overheating and damage including potentially catastrophic failure of the boiler. It is therefore extremely important to restrict and control the level of both suspended and dissolved solids within a boiler. This is achieved by either continuous blowdown or intermittent blowdown or a combination of both, and can be either automatic or manual. BG04 Boiler Water Treatment; Guidance for Shell Boilers, Coil Boilers, Steam Generators and Hot Water Boilers. Continuous blowdown is required where dissolved and suspended solids levels cannot be adequately controlled by bottom blowdown alone. The continuous blowdown process is usually automatic and is always in addition to intermittent (bottom) blowdown. It must also be noted that continuous manual blowdown is not a recommended option. Whenever a continuous blowdown system is installed, consideration should be given to the inclusion of heat recovery equipment. Heat recovery systems usually consist of a flash vessel to recover flash steam back to the feed tank and a heat exchanger to extract further heat from the residual condensate (usually to heat make-up water to the feed tank). This residual water is contaminated by a high concentration of dissolved solids and should not be recovered for use in the boiler unless suitably and adequately treated. Where the temperature is sufficiently low, the waste water can be discharged directly to drain without the need for passing through the blowdown vessel. Continuous blowdown is also variously referred to as surface blowdown, continuous TDS blowdown, TDS control blowdown, side blowdown, desalting or TDS control. Intermittent, or bottom blowdown is essential for boilers operating with internal feed water treatment; it is the only effective method of removing sludge, and should only be applied in short sharp bursts. Longer bursts aid in the reduction of dissolved and suspended solids but have limited additional benefit for the removal of sludge and are likely to interfere with the effective management of the boiler water level. Drain valves to be fitted on blowdown pipes if blowdown vessel outlet pipe is above bottom of boilers. Drain valves must be fitted so that they are reasonably accessible and provision made to accommodate drained water. Other blowdowns from a boiler, e.g. the blowdown lines from external boiler water level control chambers or water gauges, should not be piped into the main boiler blowdown line or manifold. Such discharges shall be led to a separate inlet on the blowdown vessel. Waste condensate (i.e. that which cannot or should not be returned to the feed tank) shall be discharged to drain through a blowdown vessel with a dedicated and appropriately sized connection where it cannot be demonstrated that the condensate would otherwise have cooled to a safe level for direct discharge to drain. The blowdown vessel can become very hot as a result of blowdown; the sudden or rapid discharge of pressurised hot water is hazardous. It is important, therefore, that measures are taken which prevent accidental contact but do not interfere with the natural cooling of the contents of the vessel. Because a blowdown vessel is intended to dissipate heat, it is not normal practice to apply thermal insulation. It should therefore be provided with guard rails or other personnel protection as determined through risk assessment. Because of the considerable amount of energy released, structures such as drainage ducts, culverts and sewers are likely to be damaged, and unsecured manhole lids and slabs covering blowdown pits are liable to be lifted. There is also a significant risk of injury to people working in the vicinity of any inadequately protected discharge. Unsuitable Blowdown Vessels are potentially dangerous and can fail catastrophically under pressure. The purpose of a blowdown vessel is to cool the discharge water from the boiler before it enters the drains. The Water Industry Act 1991 states that a maximum 43°C can be discharged to drain. However, if the plant has been designed and/or built with the vessel inside the building and there is a need to insulate the vessel to prevent danger to personnel or the immediate environment, then a self-acting cooling kit with fail safe must be installed, it is also recommended to include temperature measurement on the discharge. A range of supporting material can be found on the HSE website including Approved Code of Practice documents, Health and Safety Guidance, and Legal Reference documents. Note: Be aware that Approved Codes of Practice (ACOP) and other guidance documents are often withdrawn by HSE and not replaced; for this reason, CEA have created BG03 and other guidance documents. As an example, the Management of Health and Safety at Work Approved Code of Practice (ACOP – L21) has been withdrawn and is no longer available. If you are looking for information on how to manage risks in your business, HSE has a suite of guidance that will be able to help. 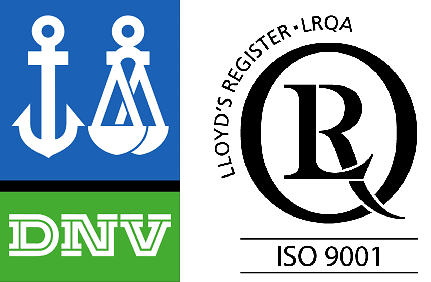 Each level of guidance on HSE’s website offers appropriately targeted information, focussed on making compliance as straightforward as possible. A revised and enhanced online version of ‘Managing for Health and Safety’ (also known as HSG65) is now available. Boiler Blowdown Vessels shall be constructed as pressure vessels to a suitable standard such as: Pd 5500 Specification for unfired fusion welded pressure vessels, BS EN 13445 Unfired pressure vessels, ASME VIII or an equivalent standard. • A serial number unique to that vessel. • The date the vessel was manufactured. • The standard to which the vessel was designed and constructed. • The maximum allowable pressure of the vessel. • Where the minimum allowable pressure is other than atmospheric, the minimum allowable pressure. • Where a vessel has a design pressure in excess of 0.5 bar, the vessel must meet the requirements of The Pressure Equipment (Safety) Regulations and bear the CE Mark. A boiler blowdown vessel shall not only be designed to withstand internal pressure, but shall also have sufficient structural strength to sustain the shock loading associated with intermittent blowdown under the worst possible in-service conditions, and be able to withstand any external loading from pipes and attachments. It is good practice to design a blowdown vessel for at least 25% of the maximum allowable pressure of the boiler to which it is connected. The design temperature of the blowdown vessel shall be the temperature of saturated steam at a pressure equal to the design pressure. On a multi-boiler installation with boilers of varying working pressures, the boiler with the highest maximum allowable pressure shall be used to determine the design criteria. Adequate internal and external access must be provided for cleaning and inspection of the vessel. • Whether the blowdown enters the vessel above or below the standing water level. • It cools the incoming blowdown, so that the resulting water going to drain is at an acceptably low temperature. • the quantity and frequency of blowdown. The standing water capacity of the vessel shall be at least twice the capacity of water which is discharged therein when the largest connected boiler is blown down. Approximately half of the vessel’s volume shall be occupied by standing water and the remainder as airspace. One recommended procedure for testing the low water cut-out and lock-out functions on an automatically controlled steam boiler is to evaporate the boiler water down to the first low water alarm level. The boiler is then blown down to the second low water level, at which point an alarm sounds . and the boiler goes to lock-out, i.e. it requires manual intervention before restart is possible (the Evaporation Test). If the amount of water blown out of the boiler between the first and second low water levels is greater than that discharged during routine blowing down of the boiler, the former quantity shall be taken into account when calculating the size of the blowdown vessel. Where boilers are attached to a vessel without the use of a manifold, or where multiple manifolds are used (e.g. to attach 4 boilers to a vessel with two blowdown inlets) it is possible that several boilers can blowdown at the same time. In such a case the volume of standing water shall be twice the maximum possible simultaneous discharge into the vessel. Where key operated blowdown valves are in use, only one blowdown key should be available in the boiler house to ensure that only one boiler is blown down at any given time. Where automatic bottom blowdown is in use on a multiple boiler installation, the designer shall ensure the control philosophy takes into account the design of the blowdown vessel and the number of boilers that can discharge into that vessel at any given time such that it does not exceed the vessel’s design criteria. Blowdown piping is subject to rapid pressurisation, high velocity flow, erosion, thermal shock and vibration, all of which can be severe. Pipework must be suitably supported. Pipe bends shall be of large radius and their length kept as short as possible. Pipework from each boiler up to and including the last isolation valve prior to the blowdown vessel shall have a design pressure and temperature not less than those of the design pressure of the associated boiler. • BS EN 13480-1 specifies the general requirements for industrial piping systems and supports, including safety systems, made of metallic materials with a view to ensure safe operation. • BS EN 13480-2 specifies the requirements for materials. • BS EN 13480-3 specifies the design and calculation of industrial metallic piping systems, including supports. • BS EN 13480-4 specifies the requirements for fabrication and installation. • BS EN 13480-5 specifies the requirements for inspection and testing. • BS EN 13480-6 specifies additional requirements for buried pipework. Guidance on conformity assessment procedures can be found in: PD TR 13480-7:2002 Metallic industrial piping. Guidance on the use of conformity assessment procedures. 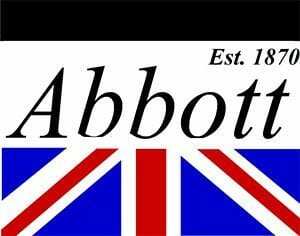 Guidance on suitable fittings is contained in: BS 759-1:1984 Valves, gauges and other safety fittings for application to boilers and to piping installations for and in connection with boilers. Part 1: Specifications for valves, mounting and fitting. The table shown below gives typical sizes of vent pipe and outlet pipe appropriate to the conditions stated. For lower boiler pressures, smaller vent sizes may be used but any variation from these figures should be agreed with the manufacturer and/or a person who is competent to advise on these matters. The table 1 figures assume that only one boiler is ·attached, or that multiple boilers are attached via a single main blowdown manifold. Notes: A pipework system consists of straight pipe and fittings, such as bends, elbows, tees and valves. All of these components can cause resistance to flow. To find the total resistance through a pipework system, it is usual to express the frictional resistance of fittings and valves as being the equivalent of the pressure drop through a number of linear metres of straight pipe. This length added to the actual length of the existing pipe is known as ‘equivalent length’. These figures have been produced assuming 18m equivalent length of blowdown pipework, a vent height of 6m, a boiler pressure of 14 bar g and a pressure build-up within the vessel not exceeding 0.35 bar g.
In the case of vessels having the possibility of several boilers discharging at once, the vent and outlet sizes shall be modified accordingly. The cross-sectional area (CSA) of the vent should normally be at least 14 times that of the combined inlets (e.g. for a vessel having two 50mm 0 inlets, the vent should be at least 300mm 0) and the overflow shall be at least 6 times the combined CSA of the inlets (e.g. for three 25mm 0 inlets, the overflow should be at least 100mm 0). Below is an excerpt from the New BG03 Guidance note Table showing that some vent sizes must now be bigger. An inlet at least equal in cross-sectional area to the area of the blowdown pipe or manifold is strongly recommended. It can either discharge into standing water or be located between the water level in the vessel and the top of the vessel. In the latter case, the shell shall be protected against erosion. This may be achieved by careful inlet design or by fitting suitable wear plates, deflection plates or baffles in the vessel (see Figure 2). • The size of the blowdown pipe system. • The vent pipe layout and length. • Where the blowdown enters the vessel, i.e. above or below standing water level. • Any arrangements for condensing the flash steam. • It is as straight as possible with no valve or other obstruction to prevent free-flow. • Where possible, it terminates in a suitable exhaust head with an adequate condensate drain. • It discharges into the atmosphere where it is not liable to cause personal injury or material damage. • In the event that safe discharge or the configuration of the building does not facilitate the vent pipe to be a straight run, it may be necessary to increase the size/diameter of the vent pipe to compensate for the resistance of the bends. The cross-sectional area of the outlet should be at least 6 times the area of the inlet pipe. Where there is a risk of several boilers discharging at once, the vent and outlet sizes shall be modified accordingly. The cross-sectional area (CSA) of the outlet shall be at least 6 times the combined CSA of the inlets (e.g. for two 25 mm 0 inlets, the overflow should be at least 100 mm 0). The attached outlet pipework should be properly designed for the required flowrate and no valves or other obstructions shall be fitted. The outlet pipe should be connected to the blowdown vessel so that the vessel will remain approximately half full of water after each blowdown to allow room for the expansion of flash steam. The outlet connection may require a water seal to prevent steam discharge. This may be achieved by extending the vertical leg of the water seal to within 150 mm of the bottom of the vessel. The top of the water seal shall incorporate a suitable opening to serve as a siphon breaker. • Drainage- the vessel shall be fitted with a suitable drain valve. • Pressure gauge – means shall be provided for attaching a test pressure gauge. • Water-level gauge- this is not considered necessary but, if fitted, must be adequate for the design conditions. • Outlet temperature gauge, which may be combined with an alarm arrangement for unmanned sites. When used in conjunction with a multiple steam boiler installation, the blowdown vessel shall be sized to suit the boiler with the largest blowdown volume. For safety reasons, it is essential that only one boiler can be blown down intermittently at any time unless the vessel and piping system is expressly designed to accommodate this. • The system shall be designed and constructed so that the valve key cannot be removed until the valve is fully closed. Automated intermittent blowdown systems can be installed without the one key arrangement but the controls shall prevent no more than one boiler on a common manifold being blown down at any one time. • Any cooling system is appropriately sized considering the possibility of multiple simultaneous blowdowns. Where blowdown lines connect to an inlet manifold to the vessel each of them shall be fitted with either a screw-down non-return valve (SDNR) or, alternatively, a non-return valve and an isolation valve. The manifold should be at least equal in cross-sectional area to the largest boiler blowdown valve in the installation. Where a cooling water injection system is employed, it is normal practice that the cooling water be taken from the town mains. Softened water is not normally required as long as boiler water is properly treated and blowdown regimes are well managed. Any temperature controller forming part of a blowdown system shall be of such design that the set temperature cannot be easily altered. Suitable preventative means include (but are not limited to) adjustment mechanisms that require a special key or tool, or removing or restricting the adjustment device after setting. Self-acting cooling systems (that use the expansion of a liquid within a capillary as the operating mechanism for example, rather than electricity or pneumatic power) are generally sufficient for the majority of applications. However, self-acting cooling systems usually fail in the closed position, so such systems are not normally suitable for use on vessels dependant entirely on the injection of cooling water to ensure a safe discharge temperature. Exceptions may be made where suitable additional protective measures are employed or where a high degree of system integrity can be demonstrated. Where quarter-turn isolation valves are used on cooling water lines, the valves shall be arranged such that the handles do not fall to the closed position. • They can be drained of all water in cold weather, in which case the vessel shall be filled to its normal level before blowing down. Do not blow down into an empty vessel. The disposal of discharge must conform to any relevant local authority regulations and the water temperature must not exceed 43°C at the point it enters the public sewer (see The Water Industry Act 1991 ). The use of brick or concrete blowdown pits is actively discouraged; steam is aggressive and new pits should not be built. Issues include leaks that remain undetected (potentially undermining the foundations of the pit or any adjacent buildings as well as polluting the land), access and falls from height (possible confined spaces), blockages from leaves and rubbish, and the need to shut down, clean and inspect which may be inconvenient for site operations. A planned preventative maintenance programme shall be drawn up to ensure that existing brick/concrete pits are properly maintained. They must be drained, thoroughly cleaned out and examined at regular intervals. It is recommended that the examination should be carried out at a maximum frequency of once in every 14 months, or at such intervals as stipulated by a Competent Person. Particular attention shall be paid to the adequate venting of the pit so that it cannot be pressurised above 0.1 bar. Access to the pit must be properly safeguarded and the covers adequately secured. Rubbish shall not be swept into the pit. • It requires major repairs. 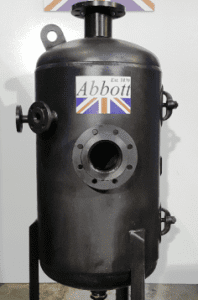 At every thorough examination of the associated steam boilers, or at such intervals as determined by a Competent Person (see PSSR 2000 regulations), the blowdown vessel should be positively isolated from the boiler(s) for examination purposes e.g. by valve removal or with double isolation and blank flange, spade or line blind. The electrical supply to any automated blowdown valve(s) should be locked off and, where fitted, any compressed-air system should be isolated and de-pressurised. The vessel should then be drained, cleaned internally and thoroughly examined. If the quality of the boiler feed water is poor, the blowdown vessel may require draining and/or cleaning more often. The positive isolation procedure is to ensure safety during examination of the blowdown vessel. Where it is necessary for people to enter a boiler in a multi-boiler installation, the fitting of a suitable blank flange in the blowdown line of the out-of-service boiler will provide a high level of protection. It should be noted that during the preparation of a boiler for statutory examination, it is necessary to completely drain the associated boiler. Where the blowdown vessel is located on a similar floor level as the boiler, it will not be possible to empty the boiler through the blowdown vessel. Care must be taken to ensure that final emptying of the boiler is only made to drain when the water temperature is below the permissible limit of 43°C. So that in our opinion is a Summary of what we see to be the main points to consider. Please refer to the full and complete official BG03 Guidance note available from CEA.